Just completed three more figures for my PanOceanean forces for Infinity – a Svalarheima Nisse with sniper rifle, a Nisse with HMG and an Akali Sikh drop trooper. As with my Fusiliers I painted a little while back, the basis of the paint job on these was to look good from three feet away, as I want a fully painted force on the table in a relatively short time. The HMG Nisse is an older model, but she’s beautifully sculpted and the animation in the pose is just great. The sculpt on the back of the leather jacket is superb. So much so, I forgot to take a picture! Really loving the anime vibe of this game, and I think it translates into the slightly brighter palette that I’ve been using for them. Suppressing an uprising near you! Very happy with the overall look so far. I’ve got bunches of other miniatures to add to the force, so expect to see some more being added soon. Lastly, a big THANK YOU to all who partook in the voting for the Horus Project poll. The option for the white ceremonial armor didn’t event get one vote, and ironically both the black armor option and the Sons of Horus colors ended up in a tie… ARGH! So, to that end, I’ll ask Superherobossladywife tonight which she likes and that will be the deciding vote…. 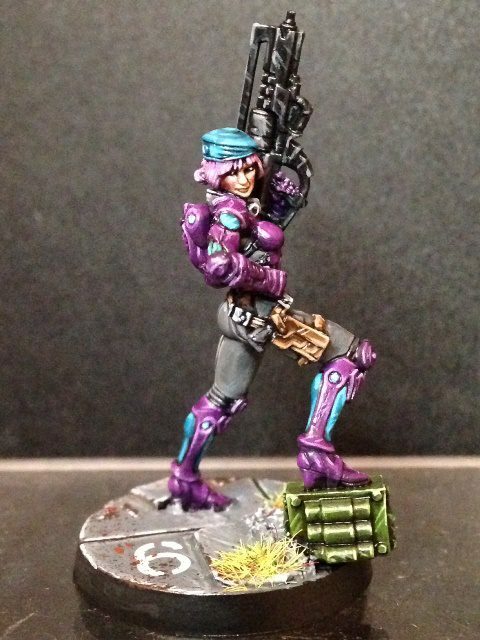 Author PaulPosted on September 17, 2018 Categories Miniature painting and techniquesTags Corvus Belli, Infinity, Operation Firestorm, PanOceania2 Comments on More Infinity Miniatures Finished! Hello! I return from the caves to bring you another post from the WCF bunker. My world has been somewhat turned on my head in the last few weeks. In early March I received a phone call from my stepmom who was in absolute pieces to tell me that my dad had passed away. It was a complete bolt out of the blue which I was totally unprepared for. Living in a different country has its advantages, but this is definitely one of the times when it does not. Suddenly I very much felt the 3300 miles that separated me and my family as I set about making arrangements to fly home, as well as being skyped in to talk with funeral directors etc. I won’t go into the whole story, but needless to say I am devastated by his passing, but thankful that I have such a supportive wife and family to help me deal with it all. 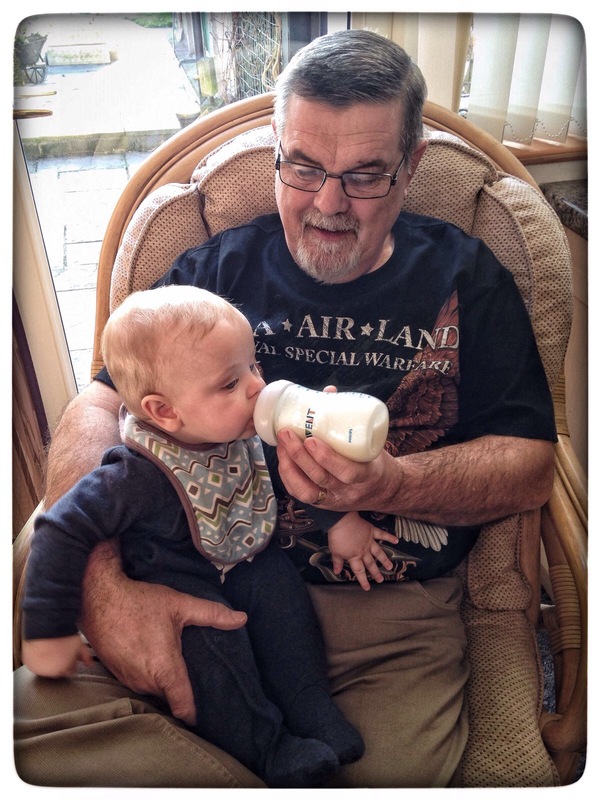 We had been out in England for christmas last year, and I’m so glad that I had some quality time with dad, and that he got to meet his newest grandson. I hadn’t expected for us to be making a trip back there so soon. Don’t take anything for granted, friends. Painting has given me something to focus on, and to take me out of things a little so I can distract myself. Thank the gods for hobbies! Anyway, as I had mentioned in a previous post, I had discovered the wondrous world of Infinity. I had heard that it was a pretty intense game, and quite complex, something that normally would put me off investigating, but after checking out the figures and the art/fluff, I got reeled in, and I’m glad I did! I hadn’t seriously taken a plunge, but a week or two ago I bit my lip, held my breath for a moment and bought the N3 edition of the Infinity rules. While I had a bit of sticker shock with the price, a swift glance through the 2 books quickly dissolved any anxiety about dropping that kind of cash (although its probably in the range of a 40K rulebook cost wise, I’m just a tight-arse). You get a rulebook and a core book with fluff and army lists. I like the fact that they split it into two volumes, as I’m sure you’ll agree it’s a lot nicer to have to carry a lighter weight book around than attempting to navigate through war and peace to find the rules you need. Anyhoo, the art is great (taking me back to my days of going to Anime conventions, which I’ll be going to next weekend too, and reading lots of Manga), and the fluff is really engaging. 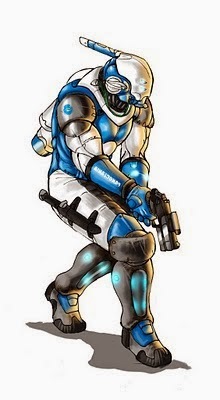 PanOceania is my faction of choice for now (until I get fully acquainted, and fully painted). They seem to be the most ‘vanilla’ faction, which is fine for me to get my feet wet. Lots of long range shooty goodness, and some really great troops types available. Also, I have a thing for the Bubblegum Crisis style helmets a lot of them seem to wear, so double win! I’ve been up to a new FLGS near me over the last few weeks to start learning the ropes (I’m more of a visual learner) and have enjoyed dropping in on a couple of games here and there. Last week and last night, however, I had my own first actual games, me vs. an opponent, under the watchful eye of Chris who has taken me under his wing to teach me the rules. Of the four games I have played so far, I have won three of them. Probably beginners luck, or the new PanO dice I bought, who knows! Last night I was playing the first three missions in the Operation: Red Veil set, and I had a blast! I really got to grips with movement and basic combat, and discovered just how much fun Auxilas with bots can be! Mechanized deployment can be a lot of fun with Dronebots, I just need to be more aggressive in using them.